As the nation’s attention refocuses on the problem of long lines – once again highlighted by President Obama in his second inaugural address – a new study suggests that more than 200,000 Florida voters may have simply given up because of long lines on Election Day. The long Election Day lines around Florida may have turned away more than 200,000 frustrated would-be voters who gave up and went home before they cast ballots — or else saw the lines and elected not to join them. Analyzing data compiled by the Orlando Sentinel, Ohio State University professor Theodore Allen estimated last week that at least 201,000 voters likely gave up in frustration on Nov. 6, based on research Allen has been doing on voter behavior. His preliminary conclusion was based on the Sentinel’s analysis of voter patterns and precinct-closing times in Florida’s 25 largest counties, home to 86 percent of the state’s 11.9 million registered voters. Around the state, more than 2 million registered voters live in precincts that stayed open at least 90 minutes past the scheduled 7 p.m. closing time, according to Sentinel analysis of voting data obtained from county elections supervisors. Of those, 602,000 voters live in precincts that stayed open three extra hours or longer. And three of the five counties with the worst lines were in Central Florida. In Orange, Osceola and Volusia counties, as many as 48 percent of those who cast votes on Election Day live in precincts that closed at least 90 minutes late, the analysis showed. Elections supervisors have blamed the long lines and delays on the cutback of early-voting days from 14 to eight that was ordered by the 2011 Legislature, a record-long ballot that included 11 lengthy constitutional amendments and a 71 percent turnout for a hotly contested presidential election. Indeed, Gov. Rick Scott said last week he’d back legislation restoring the early-voting days and restricting ballot length. But the Sentinel analysis also showed that — even in the worst-performing counties — long lines were the exception rather than the rule. In Orange and Miami-Dade, for example, more than half the precincts, including many large ones, closed before 8 p.m.
And some of the state’s largest counties — notably Duval (Jacksonville) and Pinellas (St. Petersburg) — reported almost all precincts were closed by 8:30 p.m. Still, according to Allen’s analysis of the data, the lengthy lines lowered actual turnout by roughly 2.3 percent per hour of delay. These numbers are pretty spectacular (and not in a good way), and yet it would be helpful to have a little more detail on the conclusions than a very short – and very general – methodological link so we can dig into the analysis. That’s not to say Allen doesn’t know what he’s doing; his work on voting machine allocation and its impact on voting has gotten both scholarly and popular attention. It’s just that the media tends to fix on big numbers without looking to see the origin of such numbers – or even more importantly, what election officials can do to reduce them. It’s now clear that the Administration has made eradication/reduction of voting lines somewhat of a priority; studies like Allen’s – fueled by official data like that collected by the Sentinel – is a promising way to craft solutions in the months and years ahead. 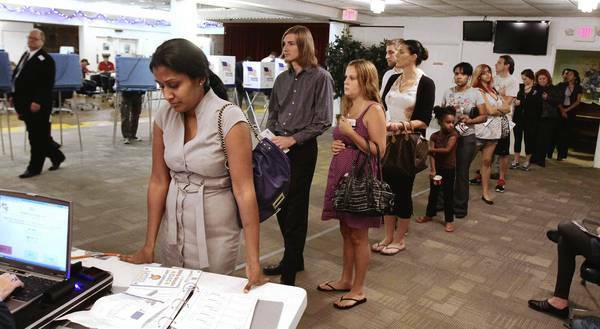 Be the first to comment on "Study Suggests 201,000 Florida Voters Abandoned Long 2012 Lines"